This time around, I think Sanders defined the agenda and dominated the discussion. Bernie, Hillary, and O’Malley. Caricatures by DonkeyHotey / Flickr. 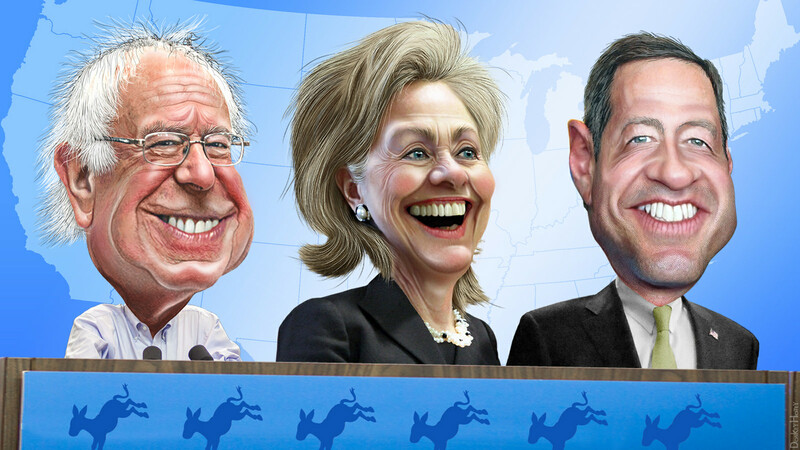 The three Democratic contenders — Senator Bernie Sanders, Secretary Hillary Clinton and Governor Martin O’Malley — all sharpened their swords in a clashing debate in their last round prior to the Iowa Caucuses and the New Hampshire primary. When those results are in, we’ll have a much better idea of the lay of the land, the one delivered by the primary voters themselves, unfiltered by polls and pundits. But in this January 17 debate, I think Sanders defined the agenda and dominated the discussion. If you’re an enthusiast for Hillary Clinton’s policies on gun control, you’d likely give her the upper hand overall. But if you understand Sanders’ views on the topic, and why he has a lifetime D-minus rating from the National Rifle Association, and are thus not impressed with Clinton trying to make Sanders into a gun nut, you’re far more likely to give Bernie the edge for the evening. Clinton tried to make Bernie into a GOP cat’s paw for sabotaging public health care. Clinton also tried her best to make Bernie into a GOP cat’s paw for sabotaging public health care. Sanders, however, not only defended his approach of using the reforms won thus far in the Affordable Care Act as a bridge to Medicare for All, he also hit hard against the purchasing of Congress with millions handed out by the insurance and pharmaceutical giants. Most of the public with any degree of political awareness understands that Sanders is the champion of single-payer, Medicare-for-all health care. Clinton’s efforts to turn that upside down didn’t get much traction. O’Malley played an interesting but not very substantive role. He tried to draw a generational divide, with himself as the youth candidate against two weary figures from the past. It didn’t work well. Where he was effective was in outlining a clean and green energy plan to bring the country primarily to solar and wind by 2050. Sanders and Clinton mentioned this too, but not nearly as forcefully. But don’t look for O’Malley to rise much above his five percent “also ran” status. Bernie was most powerful in taking on Wall Street, and exposing Clinton’s financial ties to Goldman Sachs. Clinton tried to turn it around by claiming this was also an attack on Obama, who also took money from Wall Street, but it didn’t faze Bernie one bit. He simply upped the ante with a full-throated call for class warfare against the dominance of finance capital in both business and government. Sanders was clearly the candidate of deep structural reforms and green industrial policy. On economic matters overall, Sanders was clearly the candidate of the deep structural reforms and green industrial policy associated with social democracy. When one of the moderators brought up his “democratic socialism,” he simply cut it off with “Yes, I am,” and went on into more immediate policies without missing a beat. Clinton pressed all the right buttons about jobs and the middle class and promised not to raise taxes, but offered nothing beyond the “third way” neoliberalism the Clintons were responsible for creating in the 1990s. Discussion of international affairs centered mainly on Iran and ISIS. Here the differences were subtle but important. All three supported Obama’s Iran deal and praised Secretary of State Kerry for the prisoner exchange. While noting the differences that existed between the U.S. and Iran, Sanders was more open to moving, step by step, to normalization of relations with Iran, and compared it with the new policies toward Cuba. Clinton was more dubious, throwing up all sorts of additional hurdles. Sanders was more open to seeing both Iran and Russia as players in a common regional collective security front against ISIS, and making a peace settlement that would bring a new government to Syria secondary. Clinton was not, and was more worried about what Israel might think. All three spoke out strongly on the concerns raised by Black Lives Matter. All three candidates spoke out strongly on the concerns raised by Black Lives Matter. Sanders was sharpest on mass incarceration and its racial and class injustices. Clinton, however, was skillful in appealing to Black voters, especially in bringing up the crisis in Flint, Michigan, and the lead poisoning of its water supply by the GOP governor. While he may take Iowa and New Hampshire in the weeks ahead, Sanders still has an uphill battle in South Carolina. But one point is obvious. The contrast between this debate and the GOP spectacles is like night and day. Whatever you think of the candidates, the grownups were on the Democratic platform, while the middle school playground bullies dominated the GOP stage. Read more articles by Carl Davidson on The Rag Blog and listen to Thorne Dreyer’s five Rag Radio interviews with Carl. This entry was posted in RagBlog and tagged 2016 Elections, Bernie Sanders, Carl Davidson, Democratic Debate, Democratic Primary, Electoral politics, Hillary Clinton, Martin O'Malley, Rag Bloggers. Bookmark the permalink.